Sometimes accidents just happen and nobody was at fault. Sometimes accidents happen and nobody gets injured. However, when an accident happens and someone was injured, often somebody was negligent and was responsible. When the negligent actions of another were the cause of an injury, the accident victim may assert a personal injury claim and also, seek compensation for their medical bills, pain and suffering and lost wages, if they miss work. Both businesses and individuals have a duty of care and the responsibility not to cause injury to others. Sometimes the failure to meet that duty of care results in serious harm to others. When this happens, assistance from an experienced Chicago personal injury lawyer is essential for an accident victim to recover all the damages they deserve as compensation for the injuries. Any Chicago accident victims should know that Illinois law sets time limits within which claims for personal injuries must be filed in civil court. This is known as a statute of limitations. In Chicago, an injured party has two years to file a lawsuit for most cases, and that time limit usually begins to run at the time of the accident. Some claims also have a shorter statute of limitations, such as claims against a city, the state or government agencies, making it important to hire a personal injury attorney in Chicago. It is important for Chicago accident victims to be aware that Illinois has specific rules to apportion responsibility for an accident when multiple people contribute to the cause of an accident. Sometimes an accident victim may be partially at fault for the accident and their own injuries. In the case of car accidents, multiple parties may have caused the accident, including the accident victim. Illinois law will divide the responsibility for the accident among all the parties with each party assigned a percentage of the fault. Accidents that involve multiple parties and varying degrees of responsibility involve a complex legal analysis that can directly impact an accident victim’s potential recovery. In these situations, a Chicago personal injury lawyer can help protect a victim’s rights. An experienced personal injury attorney can evaluate the facts of a particular incident and the applicable law to assess the potential for recovery by the accident victim for their medical bills, pain and suffering and lost wages due to missing work. In the aftermath of a personal injury, it helps to have an experienced Chicago personal injury lawyer provide guidance on the road to recovery. With six offices located across Chicagoland (Chicago, Downtown, Elgin, Aurora, Joliet and Waukegen), there is an office near you. Glen Lerner Injury Attorneys place great value on giving back to the community. No matter where you are, the offices of Glen Lerner Injury Attorneys or their affiliates can help. 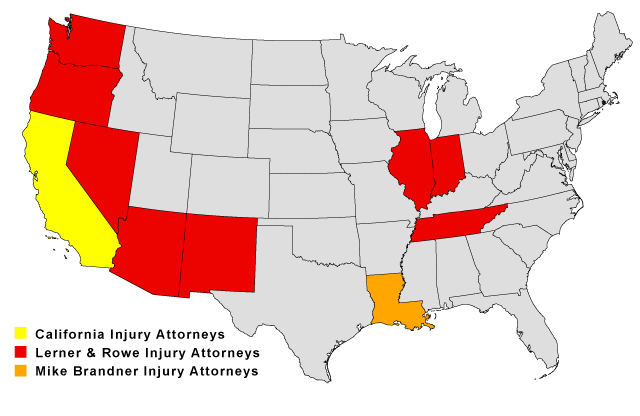 Between the different offices of Glen Lerner Injury Attorneys in Chicago and Las Vegas and Lerner & Rowe in Arizona and also New Mexico, we are licensed to help injured accident victims in the highlighted states below. If injured anywhere else in the US, we can help you through our network of attorneys and relationships built up over the last twenty-five years.